The art of Brigid Marlin describes a visionary world of almost unlimited dimensions and self-sufficiency … when I first saw The Rod I was so impressed by its imaginative sweep that I sent an enthusiastic letter of appreciation to her, the only fan letter I have ever sent to a painter. The sense of a clearly realised poetic universe, in which every detail, however modest, was accorded equal attention, was what most gripped my imagination. Surrealism, which had played a large part in forming my own view of the world, had seemed to falter with the death or old age of its greatest practitioners — Max Ernst, Magritte, Dali and Delvaux — and here in Brigid Marlin was a painter who might be the first of the next generation. I remember writing her with as much excitement as I felt when I came across the paintings of Francis Bacon in the 1950’s. The surrealist dream of remaking the world and revealing its true nature seemed to live on in the work of this woman painter … in the best and most ambitious of her paintings we see clearly her dramatic and visionary remaking of the world, but this regeneration of life and space and spirit is present even in her smallest and most domestic images. In her work, as in the greatest of the surrealists, archaic myth and spiritual apocalypse meet and fuse. In the work of this artist allegorical forms reveal a world philosophy. 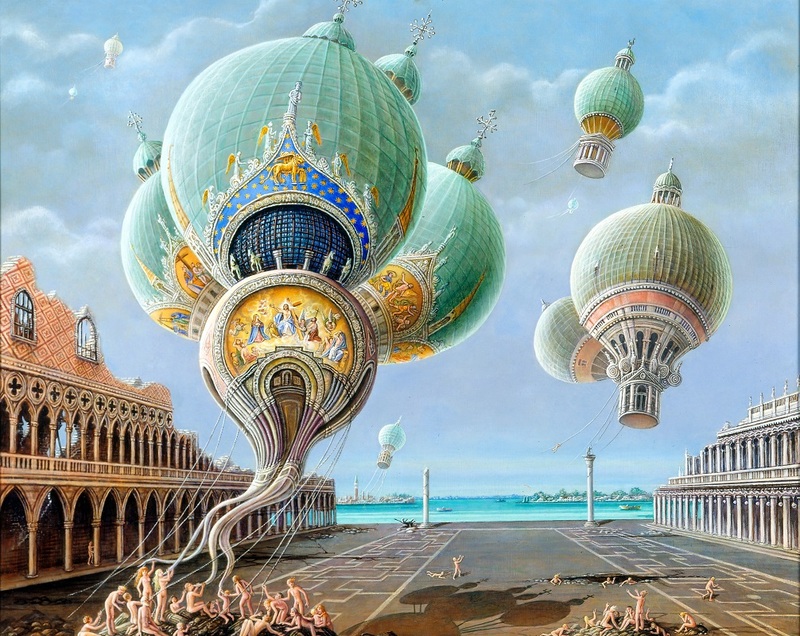 Symbols are projected into dream landscapes of transparent clarity in which different aspects of surrealism are revealed — from the convulsive forms of Dorothea Tanning, the fetishism of Dali, and the alchemical and magical sources of the Middle Ages, and then returning to close the circle of Freudian symbolism. This painter is not striving after the latest in art fashion, rather she has an iconography which searches for the hidden roots of modern consciousness, and confronts the material world with transcendence. Her thought world is realised with extraordinary perfection and penetration. Her paintings are both original and sophisticated in their dimensional world of which they are both the surface and the core, going beyond introversion and extroversion, and forcing us to guess at unknown possibilities. The absolute values of known painting fade away in the viewer, letting these paintings, undisturbed by convention, pursue their own visual and spiritual level. The compulsive picture language of Brigid Marlin hints at the visual signposts of a world whose deeper meaning slumbers in a kind of presensuality. One might say that here are beautifully depicted nightmares of the psyche, or that there are effortless presentations of the art of madness. The visual foreground is cleared away, the creation becomes transparent, and one enters a world which radiates rare psychological effects, testing the capacity of the spectator’s power to experience her art.